In this blog, Harbour Kitchen function rooms continues our discussion on why a winter (or autumn) wedding can be great choice. Once you’ve cast off the shackles of weather worries, you are free to focus on the aspects of wedding planning that are within your control. One of these aspects is design. 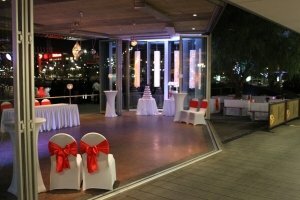 All weddings tend to be stylish affairs, but it is important to add a personal touch to your celebration. Most couples have a style or theme in mind that has meaning to them and it takes on extra significance if your special day will largely be spent indoors. 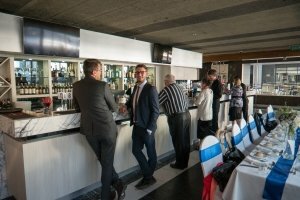 Each of Harbour Kitchen’s function rooms are presented beautifully, with an emphasis on the elegant and tasteful, but we also welcome our guests to add their own design flourishes to really make their day unique. For many people, the best part of getting married is the honeymoon. The pressure has been released, there is no one left to impress and you are free to spend some quality time with your new husband or wife at an idyllic destination. For most, idyllic means hot, and a northern hemisphere summer gives you the greatest range of options. 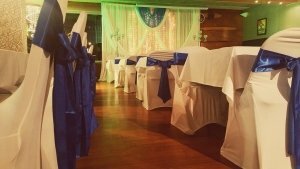 Celebrating a winter weddings at function rooms in Australia means newlyweds can migrate north immediately for some well earned sun and fun. Whether you are heading interstate to Queensland, or winging your way to Scandinavia for a few months (or anywhere in-between), a winter wedding opens many (north facing) doors to a honeymoon in warmer climates. Your wedding day is going to be special for you regardless of the date you decide on. This is not quite so true when it comes to your guests. As the popularity of weddings in summer is so high, people can find themselves invited to one (or two) weddings every weekend. Each successive event begins to lose its lustre and its appeal. 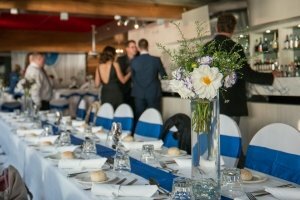 By choosing a less popular time of year for your wedding, you’ll ensure your friends are more excited than jaded, and this will be apparent in the atmosphere within your chosen function rooms.